We head to Yallourn North skatepark every Thursday night from 4-6pm bringing you free social sports, free food, and heaps more! If the weather is poor, we will be set up next door at the primary school basketball shelter. Stay for the whole time or just a bit, come and chat, watch, play for fun, or compete. Totally up to you! 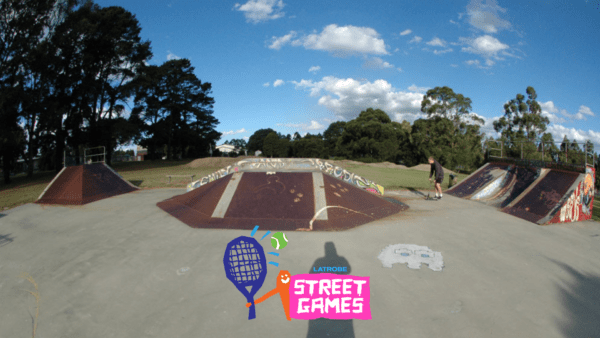 Latrobe Streetgames is about getting out, having fun with your mates, and getting active. plus all the other perks, like free food and merch! We run weekly social sports sessions in seven different towns, short sports series, skate, scooter and bmx events, and pop up around the community! Just rock up! We are led by and for young people in the Latrobe Valley with a crew of over 30 passionate staff and volunteers. check out our website, facebook, or instagram for more information! We can’t wait to see you at one of our events! Great initiative… especially for young kids and teenagers in small communities, to get them out having fun, socialising and being active!